Manly’s book will teach children of all ages to address their anxiety with meditation. 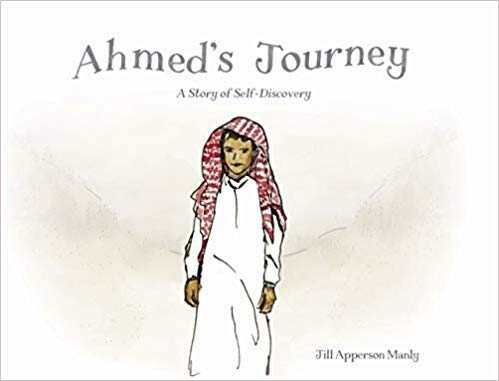 In Jill Apperson Manly’s beautiful picture book, Ahmed’s Journey, a nervous child uses anxiety-reducing techniques in preparation for the famous camel race on the Arabian peninsula. Ahmed and his family have crossed the desert, setting up camp in various places along the way. At the final camp, Ahmed feeds and pets his favorite camel, Jamal, thinking about how nervous he is to participate in the race. Alone with the camels while his family eats dinner on the other side of the camp, Ahmed observes a forming sandstorm, and he equates its moving and strengthening wind to the anxiety that’s building in him. As the sandstorm whirls around him, Ahmed takes inventory of all the sensations in his body, taking deep breaths as he often sees Jamal do. By the time the storm passes, his anxiety has passed, too, thanks to those meditation techniques. Through tactile, visual, and other sensations, the book describes what is going on around and within Ahmed. Of the storm, it says, “He feels his robes press against his skin. … He tastes the rough dryness of grit and pebbles.” Meanwhile, he also feels “discomfort in his stomach and tightness in his throat.” These anxious sensations are realistic and eloquently described. The book’s expressive language is made all the more efficacious because of its lovely, simple illustrations. The landscape especially comes alive through the artwork, with swirling sands shifting in the wind and mild tones of tan, blue, and red bolstering the calming atmosphere of the story. The amount of text per page varies, and italics, bold print, and capitalization are used to emphasize certain words. Cultural details place Ahmed in a tactile location and situation. The book’s relaxation techniques emphasize taking deep breaths and taking note of external and internal changes; these instructions benefit from Ahmed’s pertinent and specific example. No judgements are made about fear. A welcome addition to any anxiety-prone child’s home library, Ahmed’s Journey is an evocative, gentle picture book.